John Anthony Whitehurst was born December 25, 1970 to Richard and Kathleen Whitehurst. On February 9, 1991 he married his wife Tina Whitehurst. Together they raised their 3 children Amanda, Kaelyn and J.T. He left this world on September 6th, 2018. I write this in hopes to portray his loving heart and beautiful soul. First and foremost, he loved. He loved his wife of 27 years beyond bounds with no exceptions. Soulmates such as them have a love that will last in this world and beyond, forever. He loved his children Amanda, Kaelyn and J.T. to the ends of the earth and always expressed how proud he was of them for the loving, kind and strong adults they have become. This September they celebrated their 10th anniversary as business owners of Western Recreation. Johns battle with his health was a fight that he had to face every day. He is a kidney transplant conqueror and a man that all admired. He persevered to spend every precious moment with the ones he loved enjoying life. 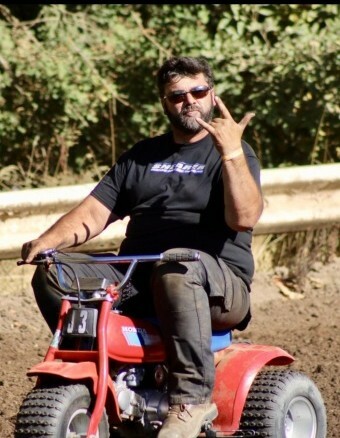 John was the strongest man we knew and had a passion for drag racing, sand dunes, motorcycles, hunting, camping and above all, family. He was fortunate enough to spend his last weekend racing with his wife and winning one last trophy. He was known for his loyalty, kindness, compassion, loving heart and most importantly, he was loved. Loved by his family, friends and all the lives he had touched. John is survived by his wife Tina Whitehurst of 27 years, daughter Amanda Seiver and husband Andy, Daughter Kaelyn Whitehurst, Son J.T. Whitehurst, Granddaughter Laelonna Coffman, Grandson Bryce Seiver, Step mother Marilyn Whitehurst, mother Kathleen Hoffman,Brother Rick, Grand mother Marie Sanowski, Uncle Bill Sanowski, Sister and brother in law Dana and Levi Larison, nieces and several Aunts, Uncles, cousins and many close friends. He is preceded in death by his father Richard Whitehurst and grandparents. A memorial will be held Saturday September 15, 2018 at the Church of Christ on 3rd at 3pm. Any donations for the family may be sent to 2807 SW High Desert Dr, Prineville, OR 97754. Any flower donations for the service, please send to the 1095 E 3rd St, Prineville, OR 97754.